This is an opinion piece on psychiatric drugs and why we may well be compounding mental health difficulties because of inappropriate prescribing. Firstly, however, it is important to make a point about the language used. For simplicity’s sake, I have used drug descriptions that many of us are familiar with; antidepressants, antipsychotics and anxiolytics. These names give the impression that the drugs are targeted medications that address or resolve an underlying specific disease or illness. This is all part of the myth and misinformation that surrounds this whole area of medicine. The ‘diseases’ or ‘disorders’ that these drugs are commonly used for are based on subjective lists of symptoms and/or behaviours. They are not based on an understanding of any underlying pathology and how it may differ between someone who receives a diagnosis and someone who does not. In writing this blog, it is tempting to use the original names of the drugs, since these more accurately reflect the drug effects, rather than their supposed action against a ‘disease’ or ‘disorder’. The drugs we call antidepressants were known in the 1950s as ‘psychic energizers’ because it was observed that patients receiving iproniazid for tuberculosis experienced a lift in mood concurrent with treatment. Antipsychotic drugs are also known as neuroleptics (which means ‘nerve seizing’) or major tranquillisers and were first used for psychiatric patients in the early 1950s. After a dalliance with toxic and addictive barbiturates, benzodiazepines came along and were known as minor tranquillisers before being renamed anxiolytic (anxiety relieving) drugs. There are several classes of drug referred to an anxiolytic, but benzodiazepines are the most well-known. It was in these early days that pharmaceutical researchers named these drugs as ‘anti’ to a disease that they were supposed to treat, in the hope that we may think of them as we do antibiotics or anti-inflammatory drugs. So for the sake of simplicity, I have stuck with the standard nomenclature and dispensed with quote marks, but it is important to note that the names of these drugs probably owe as much to marketing departments as they do scientific laboratories. 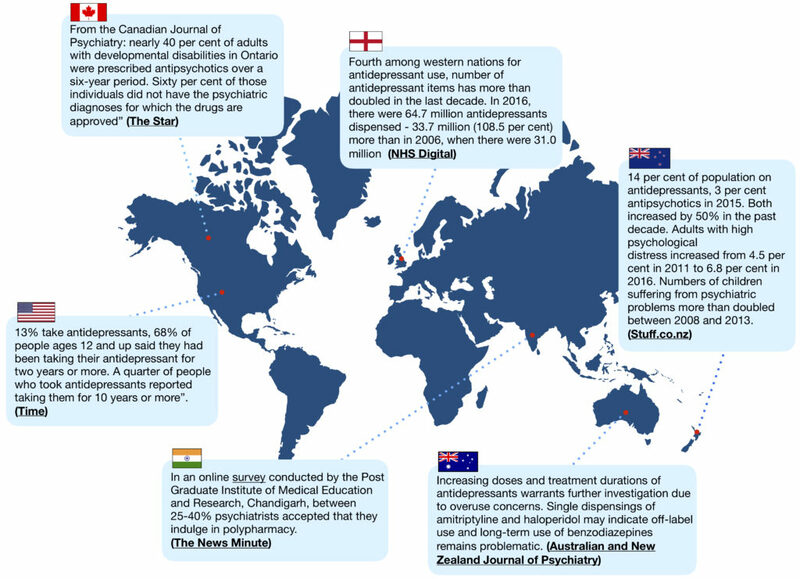 Psychiatric drugs are a global marketing phenomenon. In the US they are among the top ten most prescribed drugs, outpacing treatments for cardiac problems, cancer and high blood pressure. NHS digital report that in the UK, medication for high blood pressure is the most commonly prescribed item, followed by statins, indigestion remedies, painkillers and antidepressants. It reports that across drug groups, the greatest rise in 2016 was among antidepressants, with 3.7 million more items dispensed than in 2015, a six per cent rise. In 2017, UK doctors prescribed 67.5 million antidepressants in total. Psychiatric drugs have entered the public consciousness like no other medications. They are written about in newspapers, discussed on chat shows, given cute names like Happy Pills or California Rocket Fuel. Should we be worried about the dramatic rise in prescribing? If 1 in 10 adults are on the drugs for extended periods, should we be concerned? What about when that figure inexorably creeps towards 1 in 5 or 1 in 2? Does it feel right that the number of children – some as young as five – being prescribed antipsychotics has doubled between and 2006 and 2011? Is it right that antidepressants have become a lifestyle accessory? Is it a good thing that we have normalized the conversation such that taking powerful, mood-affecting drugs is something we see as part of everyday life? Given the dramatic rise in prescribing are we all now mentally healthy, free to get on with our lives? More and more patients, professionals, academics, authors and scientists are stepping forward in recent years to sound the alarm, yet we seem not to be listening. The situation we are in now is an unholy alliance between the marketing power of the pharmaceutical manufacturers and the cognitive dissonance of prescribers, who struggle with the notion that their treatments can be anything but beneficial. In short, the medical profession has no reason to change, no reason to come clean about the harm being done by casual and liberal prescribing. It is time we took a stand as consumers since we cannot trust the evidence and science that the medical profession professes to rely on. We have bet the farm on the pharmacological revolution and we are losing that bet in spectacular style. I’ve been taking an antidepressant for six years now, but in the last two years, I have come to feel that a grim future faces us unless we clamp down hard on the prescribing of psychiatric drugs. For a treatment to be approved, I had previously assumed that it must be proven by the evidence that the benefit to the patient outweighs the risks. Recently, I have come to understand this is a popular misconception and that the onus is on us, as consumers receiving treatment, to review this evidence for ourselves and make a decision that is in our best interest. This is especially important for drugs that are taken for long periods, where damage may be compounded, and dependence may result. We all know the horror stories about chemotherapy, the damage done to fast-growing cells like the hair follicles leading to hair loss and the stomach lining leading to relentless nausea and vomiting, yet we accept that to treat an aggressive cancer sometimes requires aggressive short-term therapy. Is the same true then of ‘mental disorders’ which we don’t understand, can’t explain and have never proven to be biological in origin? Are all those taking psychiatric drugs merely guinea pigs in a mass unlicensed clinical trial? Have we learned nothing from the rise and fall of barbiturates, which in retrospect given how toxic and addictive they are, seem like a very poor choice for mass market medications? That psychiatric drugs are vastly overprescribed with no apparent decrease in suffering. That they come with serious adverse effects that are sometimes irreversible even when the medication is stopped. That they are not particularly effective. That they can lead to dependence and withdrawal symptoms in around half of those who take them. That the science and evidence supporting their use is biased and unreliable. Let’s take each of these points in turn and let us also dispose of industry-sponsored evidence and trials in favour of the view of people who do not spend significant amounts of time at pharma-sponsored conferences and those who do not have extensive pharma share portfolios. Those brave people who have stepped away from the conventional wisdom and have willingly put themselves in the firing line. Why would they do that when it is so much easier, and probably considerably more lucrative, to toe the party line? What would motivate academics and psychiatrists to speak out against their own professional bodies or their colleagues, could it perhaps be the desire for the truth to be told? Anatomy of an Epidemic, Magic Bullets, Psychiatric Drugs, and the Astonishing Rise of Mental Illness in America by Robert Whitaker. The Emperor’s New Drugs, Exploding the Antidepressant Myth by Irving Kirsch. A Straight-Talking Introduction to Psychiatric Drugs by Joanna Moncrieff. The Systematic Corruption of Global Mental Health: Book One: Prescribed Drug Dependenceby Terry Lynch. Your Drug May Be Your Problem, How and Why to Stop Taking Psychiatric Medications by Peter Breggin. Bad Pharma: How drug companies mislead doctors and harm patients by Ben Goldacre. Deadly Medicines and Organised Crime: How Big Pharma Has Corrupted Healthcare by Peter Gøtzsche. Messages alerting us to the dramatic rise in prescribing numbers have been given by the media, by celebrities, by academics and by psychiatrists. The World Health Organisation (WHO), Organisation for Economic Cooperation and Development (OECD) and US Centers for Disease Control and Prevention (CDC) have all sounded notes of caution. However, neither regulators, prescribers or patients seem to be listening because the trend has continued unabated and prescribing numbers continue to climb across the world. The numbers involved are shocking and concerning, yet the economic and social burden of ‘mental illness’ continues to rise. There isn’t room enough in a blog such as this to go into detail about prescribing changes for antipsychotic, anxiolytic, sedative and stimulant drugs. Instead here is a flavour of the trends. 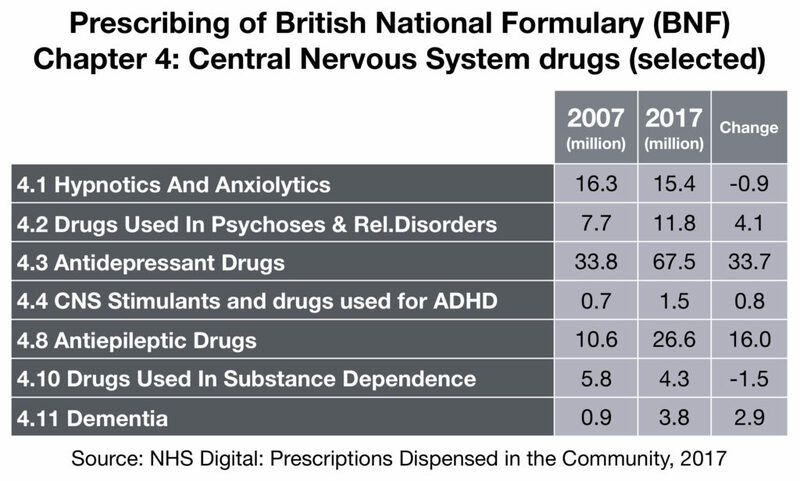 In the British National Formulary, which is the prescribers bible, Chapter 4 represents Central Nervous System drugs including antidepressants, antipsychotics, anxiolytics, antiepileptics and sedatives. The total numbers prescribed have increased by 50% across the whole chapter between 2007 and 2017, from 138 million in 2007 to 208 million items in 2017. One may question why antiepileptic drugs are included here, but part of the reason for the increase shown is unapproved, off-label use of Gabapentin (Neurontin) for bipolar disorder and ADHD, which itself was the subject of a 2003 lawsuit, settled for $430 million. Recently we have also seen evidence of an international effort to boost prescribing numbers for benzodiazepines, even though many prescribers are more aware of the need for short-term prescribing than they are in the case of antidepressants. Antidepressants may be the visible ‘poster child’ of psychiatric prescribing, but increases are being felt in many classes, yet the science supporting such increases is proving very difficult to find. The main reason given in interviews with prominent psychiatrists and doctors is “more people seeking help”. Have you ever actually read the Patient Information Leaflet that comes with your drugs? Some have, many won’t for fear of being frightened. At first reading, you may feel it is a comprehensive listing of effects with reassuringly small percentages of those potentially affected. However, since most clinical trials obtain results after a short treatment period (eight weeks in the case of the largest ever antidepressant meta-analysis) is it not then safe to assume that the reports of adverse effects are similarly based on short-term reporting only? Does the leaflet indicate over what time period you may experience certain symptoms? If not, perhaps it should, in order to help us all make an informed choice. For example, how would you feel if the leaflet said you have a significant chance of permanent sexual dysfunction after taking an SSRI antidepressant? Or a high chance of being affected by tardive dyskinesia in the case of an antipsychotic, or interdose withdrawal and protracted withdrawal syndrome from a benzodiazepine? In particular, you may want to pay close attention to the section labelled “frequency unknown” as these adverse effects seem to crop up far more readily than we have been led to believe. A swift Google search of drug company settlements tells us something significant. The pharmaceutical manufacturers preference is to spend millions of dollars in settlements to suppress the message that the drugs could be dangerous. If they had evidence that proved beyond doubt that the drugs were safe, would they not then fight each trial to conclusion? How did this modest appraisal be amplified to the status of a clarion call to the UK population? Perhaps this Press Release from the Science Media Centre tells us what we need to know. It seems clear that a great deal of effort and time went into this meta-analysis, which is time and effort that could have been saved because this large, exhaustive study confirmed the conclusions reached by Professor Irving Kirsch more than ten years ago. If psychiatrists really wanted to help us with the minimum possible harm, they would consider prescribing a placebo. Many people would experience near the same level of relief when compared with the active drug (as demonstrated in the Lancet meta-analysis) but they would be exposed to less severe adverse effects and the potential for dependence would be minimized. Psychiatry may claim it to be unethical to knowingly prescribe a drug with no active ingredient, but I argue it is unethical to prescribe psychotropic drugs without a balanced and realistic assessment of the potential for harm, weighed up against the chance of benefit. Prescribing placebos, even with full patient knowledge, is already under investigation and showing great potential, this is not myth, it is simply harnessing the human body’s incredible powers of healing when given the correct stimulus. In April 2018, the New York Times ran an article recounting the experiences of people who had tried to stop taking their antidepressant drugs. Shortly after the article was published, the comments section saw a huge influx of people recounting their awful experiences and over 8,800 people wrote in to share their stories. If you take time to read many of the comments, a theme emerges and that is one of professional medical denial. In many cases, people report that their experiences were discounted by their doctors, or even worse they were given such poor-quality withdrawal advice that they became very ill as a result. Some commenters reported that these difficulties were then further dismissed, leading to accusations of attention seeking or being labelled with some medically unexplained somatic or functional disorder (for which ironically the suggested treatment includes antidepressant medications). Advise people that discontinuation symptoms may occur on stopping, missing doses or, occasionally, reducing the dose of the drug. Explain that these are usually mild and self-limiting over about 1 week, but can be severe, particularly if the drug is stopped abruptly. Normally, gradually reduce the dose over 4 weeks (this is not necessary with fluoxetine). Reduce the dose over longer periods for drugs with a shorter half-life (for example, paroxetine and venlafaxine). Nowhere in this paragraph is there a single reference to a study or observational account that we can use to assess the evidence supporting this view. Not only that, the advice given is so generic as to be less than helpful either for doctor or patient. For example, precisely how does one “gradually reduce the dose over 4 weeks”? This is not possible using conventional standard registered dosages, so the doctor has no alternative but to give advice that the patient cannot follow irrespective of how much they would like to. I believe this lack of clarity, the lack of evidence and the reliance on guesswork and anecdotal experience risks failing both patients and doctors alike. Furthermore, the largest direct-to-consumer survey of antidepressant users to date found that 27% of 1,521 users in New Zealand experienced antidepressants to be addictive. More than half (55%) reported withdrawal symptoms and 46% of those described the withdrawal symptoms as ‘severe’ (Read et al., 2014). So, who is correct, those with a vested in interest in downplaying concerns with the drugs, or people who only seek recognition of, and support with their struggles? The complaint against the Royal College remains an ongoing concern, but if you would like to see some of the responses to the Royal College’s two-week statement first hand, you need only search Twitter using the hashtag #MoreThan2Weeks. It is fitting that many entire books have been written on this subject because it is a broad, complex and utterly bewildering area of medicine. As a non-expert, I don’t have the experience, wit or wherewithal to concisely recount the tricks, shortcuts, underhand practices and downright dishonesty that goes on in trials of psychiatric drugs. The best quote I have ever heard on this comes directly from Robert Whitaker, science writer and journalist, who himself once ran a company reporting on clinical trials. In relation to randomised controlled trials of psychiatric drugs, he said to me “these studies are designed in such a way as to tell a story that will make that drug successful in the marketplace”. Does this sound to you like an approach that will generate the safest, most cautious approach for the consumer? Recently, you may well have heard psychiatrists and researchers wringing their hands and telling us “there is no research into new psychiatric drugs”. Quite often they decry the criticism of the drugs and the fact that pharmaceuticals aren’t making money any more from psychiatric prescribing because most, if not all drugs are now off patent and can be manufactured, under license, as generic medications. The last time I saw any kind of licensing agreement, significant sums of money were involved for the licensee and I don’t hear pharmaceuticals very often issuing profit warnings. So, I have little sympathy because the fault here lies with the pharmaceutical manufacturers themselves, they have saturated every market they can access, played fast and loose with the science and been held to account in courts of law. To then exit a particular market because of such behaviour seems motivated not by concern for patient safety. As an aside, here is an interesting piece on the costs of setting up your own generic pharmaceutical manufacturing business. Deciding to take a psychiatric drug is one of the most important decisions you will ever take. Faced with a decision of this magnitude it pays the smart consumer to know the facts and be prepared. These drugs are not proven to be safe or effective, despite what psychiatry tells us and taking them should be approached with caution. Furthermore, the particular drug that it is recommended you take and at what dosage is not evidence-based, those decisions are based on conjecture, observation, a feeling the doctor has. Is that sufficient for you to feel comfortable that your safety as a patient is paramount? If your doctor prescribes you a psychiatric drug and you go back for your check in at eight weeks, ask your doctor to prove to you using the evidence that there is benefit in you taking the drug for longer periods. They must have based the decision to medicate you on evidence, so make a polite and reasonable request to see that evidence. They will struggle, because the high-profile studies, like the recent Lancet antidepressant meta-analysis, are fundamentally flawed, taking their results at eight weeks, totally out of step with how these drugs are prescribed. If you take the drugs for longer than eight weeks, you are in uncharted territory as far as the clinical trial evidence is concerned. If studies exist that prove beyond doubt that the drugs are safe over years and years of use, let’s see them. Could there be a reason why psychiatry redirects and avoids answering the key question for anyone struggling with their mental health: are the drugs safe for long-term use? If there were studies proving this, surely psychiatry would have been shouting the results from the rooftops, instead, we are met with deafening silence on the matter. What you may well find then, is that your doctor or psychiatrist falls back on the old reliable “in my clinical experience” argument, claiming that they have seen hundreds of patients benefit with no ill effects or problems coming off the drugs. Well, I’m sorry dear doctor, one cannot have one’s metaphorical cake and eat it too, that is not how evidence-based medicine works. Show me the clinical trials and please excuse me if I am not totally reassured by your opinion, no matter how well-intentioned that may be. My long-term physical and mental health and wellbeing could well be at stake. Many academics, mental health professionals and doctors feel that mental health is a social issuethat requires social interventions. Psychiatric drugs can’t address isolation, poverty, inequality, racism, intolerance, hatred, bigotry, sexism, etc., but they can mask those things. Perhaps that is why they are so successful. The blame is placed on us, the patient, for being broken because it obviates the need for powers that be to take any action to address those underlying causes of distress and suffering. I argue that the power is in the hands of the well-informed consumer and that psychiatric drugs should be treated like any other commodity. We should coldly and from a distance weigh up the pros and cons and consult a wide range of views and sources before making a decision that we feel is in our best interest. For some, that will still be medication but hopefully based on a decision that is fully informed and not coerced or made because of myths and half-truths. Six years ago, I would have welcomed the chance to make an informed choice and an informed decision about treatment. I was weak, fatigued and vulnerable being utterly and completely in the frigid embrace of depression, consumed by fear and lacking the mental facility to question what I was being told. I was coerced and led on a merry dance, ultimately to the detriment of my health, my confidence, my family and my social life. You deciding to take drugs for a mental health problem is YOUR decision, not mine, not your doctors. Treatment decisions require careful judgement and the help of an impartial supporter. Finding an impartial supporter is difficult but not impossible and could immeasurably improve your long-term outlook. There are no certainties where ‘mental illness’ is concerned and that applies equally to the medications we often use in response. If you are currently taking psychiatric drugs and you decide they are not for and you wish to stop, please do so slowly and sensibly, preferably with the help and support of an experienced practitioner who has successfully withdrawn people from their drugs previously. If finding someone face to face is too difficult, there are excellent and reliable online resources like the Inner Compass Initiative, Surviving Antidepressants, Benzo Buddies and Mad in America’s Provider Directory to name a few. Finally, in every piece on this subject that I have ever read, there is a section dedicated to apologising for having views that are contentious. I will not do that. Instead, I say that your suffering is real, the cause is contested, and the recommended treatment could be harmful if relied upon for longer than necessary. The choice, as they say, is yours, but when you do make that choice, make it an informed one.